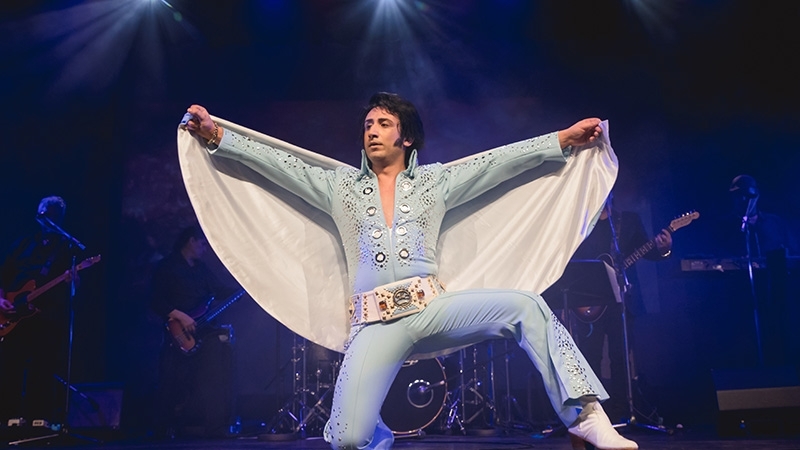 Genesis Entertainment proudly presents Sean Luke Spiteri A Recreation Of 'Elvis On Tour'. Sean Luke Spiteri has been electrifying audiences for over 16 years. His high energy presence, charisma and passion on stage has brought him much success. His moves are the sharpest in the country and his strong Elvis vocals along with Sean's authentic Elvis wardrobe is a dynamic combination to witness live. Sean truly captures Elvis, at the peak of his career. His success as one of Australia's leading Elvis tribute Artists has taken him from Australia to the USA. Sean is a multi award winning Elvis Tribute Artist, which has lead him to perform in Memphis Tennessee, Elvis Presley's hometown. This show will recreate 'Elvis On Tour' during 1972 when Elvis played 15 nights in 15 cities selling out every show. It is a non-stop electrifying concert production backed by live musicians. This spectacular show will showcase 2 Elvis Jumpsuits from Sean's authentic wardrobe which Elvis wore during Elvis On Tour. Sean will sing all the hits from Burning Love to An American Trilogy and much more. Don't miss On Tour it is a must see concert for all Elvis fans.